BAE Systems is showcasing a scale model of its Type 26 Global Combat Ship Frigate at DSEI 2013, the International Defence & Security event in London, United Kingdom. While the general lines of the Frigate stay similar to the one first shown at Euronaval last year, the scale model on display at DSEI 2013 features a few noticeable design changes. Navy Recognition had the opportunity to ask a few questions to Geoff Searle, Type 26 GCS Programme Manager, on the BAE Systems stand during DSEI 2013. 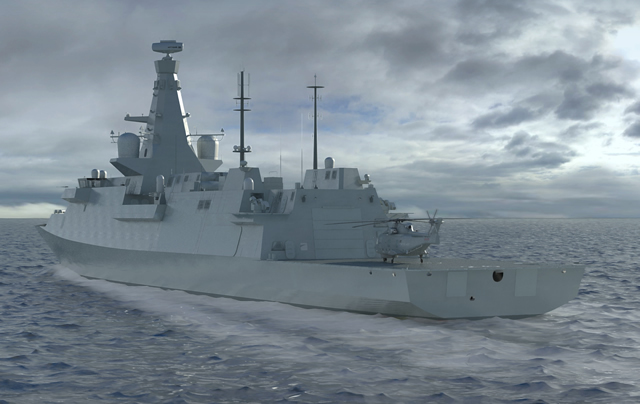 DSEI 2013 was also the occasion for BAE Systems to award four key design contracts for the Type 26 Global Combat Ship, demonstrating the momentum building behind the programme to deliver the UK Royal Navy's next generation complex warships. The Design Development Agreements with Rolls-Royce, MTU, David Brown Gear Systems and Rohde & Schwarz cover propulsion and communications equipment for the ship design. Geoff Searle, Type 26 Global Combat Ship Programme Director at BAE Systems, said: “Confirming our first major equipment design partners is a huge step forward and reflects the maturity we have achieved in the ship's design. We are working closely with the Ministry of Defence and our suppliers, bringing expertise together from across industry and we are now at the stage of developing detailed design of systems and equipment that will go into the ships. The UK's Type 26 Global Combat Ship will employ a Combined Diesel Electric or Gas Turbine propulsion system. This will enable the ships to achieve high speeds, whilst also providing an economic power to the onboard systems and will allow the ships to operate quietly in cruising mode. Rolls Royce has been selected as the design partner for Gas Turbines, while David Brown Gear Systems Ltd will develop the Gear box and MTU the Diesel Generator Sets. Rohde & Schwarz has been selected to design the Integrated Communications System for the ships. One of the major design change since Euronaval 2012 is the Chinook-capable flight deck and the relocation of the Mission Bay. The Assessment Phase for the Type 26 programme began in March 2010, with a joint team of 550 engineers from BAE Systems, Ministry of Defence and wider industry working across Bristol, Portsmouth and Glasgow to develop the detailed specification for the ships. The Ministry of Defence is expected to make its Main Investment decision around the middle of the decade, with manufacturing planned to start in 2016 and the first Type 26 set to enter service as soon as possible after 2020. The planning assumption is for a Class of 13 anti-submarine warfare and general purpose ships to replace the capability of the UK Royal Navy's Type 23 frigates with enhanced, flexible modern warships. The Global Combat Ship will be a multi-mission warship capable of undertaking a wide range of roles from high intensity warfare to humanitarian assistance, either operating independently or as part of a task group. Designed with an acoustically quiet hull, it will support anti-submarine warfare, air defence and general purpose variants. The Global Combat Ship will take full advantage of modular design and open systems architecture, ensuring it can be easily upgraded as new technology develops and can accommodate sub-systems and equipment to individual customer needs. BAE Systems, today also unveiled the latest imagery of the ship, which shows the maturity of the design and provides an insight into how the Global Combat Ship will look.